An extensive promotional campaign for investment opportunities available in the Sultanate, and at Al Duqm economic zone specifically, kicks off in Istanbul. 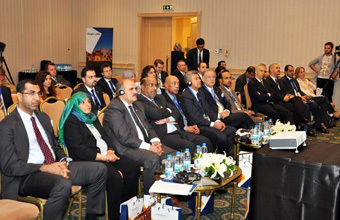 The campaign which is titled "Al Duqm Invites You" will go on to May 29,2013, and is attended by a variety of Turkish entrepreneurs, economists, media and top officials from the Sultanate\'s Honorary Consulate in Istanbul. HE Yahiya Bin Said Al Jabri, Chairman of the Duqm Special Economic Zone Authority (SEZAD) stressed that the campaign is designed to inform the Turkish entrepreneurs on the investment available in SEZAD; including the facilitations and advantages for the investors, as well as, the expected role of SEZAD at attracting more investments in the future. Al Jabri pointed out that the Turkish investors have deep knowledge of business, at the regional level, and they play an essential role at the international level. HE Al Jabri said that he will invite during the visit to Istanbul, the Turkish entrepreneurs and investors to visit the Sultanate to be closely informed on the economic zone of al Duqm and investment climate in general in Oman; stressing that SEZAD is one of the results of Oman Vision 2020 through which the sultanate of Oman seeks optimizing economic investments and expansion in order to have a room of opportunity to create more new jobs for the nationals, develop Al Wustta Governorate and innovate alternatives that contribute to the enhancement of economic resources in the Sultanate. The Omani delegation participating in the campaign includes top officials from Agriculture and Fishiries Ministry, Oman Dry Dock, Duqm Port Co., Omran and Oman Oil Co.
Ismael Bin Ahmad Al Baluchi, Deputy CEO of SEZAD stressed that the authority follows on and studies the submitted investment requests, carefully and accurately, in order to specify the best location for them on the map of SEZAD, in a correct manner. SEZAD, according to Al Baluchi, inspires to attract big investments from international and national big companies to optimize the economic benefit of the projects that will be established and created there in heavy industries sector, tourism and the various industries. Al Balushi said that SEZAD is a very promising project thanks to the stability, beauty, tranquility, strategic location of Al Duqm, attractive investment advantages, the availability of energy sources, natural raw materials and fisheries and proximity of consuming markets in Southeast Asia and East Africa. Moreover, it can be a hub connecting the local markets in Southeast Asia and East Africa to their counterpart in GCC. Al Baluchi pointed out that there are a variety of targeted sectors in SEZAD; including petrochemical industry that is based on gas and oil derivations, such as oil refining; intermediate chemicals industry; plastic industries; paints and adhesives industry and mineral oils industry. The projects include extraction of natural mineral ores and the affiliated industries such as basalt fiber, thermoelectric materials, glass industries, cement, building materials, lime, gypsum, marble, fertilizers and ceramic, as well as fisheries projects. Salah Al Gazali, investment manager at Oman Tourism Development Co. (Omran) said that SEZAD is concerned to highlight the economic and investment incentives the Sultanate has, in order to attract investors from all over the world, because investments are one of the essential requirements of prosperity and development of economic zones. According to Al Farsi, Omran doesn\'t spare effort to be one of the supporters of this strategy. The company is working on developing tourism projects to increase hotel occupancy rate in the Sultanate, and to meet the increasing demand on accommodation facilities by the entrepreneurs and visitors of Al Duqm. Omran launched, up to now, the three-star Al Madina Al Duqm Hotel and the four-star Crown Plaza Al Duqm Hotel. Khaleel Bin Ahmad Al Salmi, Deputy CEO of Oman Dry Dock Co. (ODD), said that "the participation of Oman Dry Dock Co, which is the first operating company in SEZAD that handles ship repairing and maintenance, in the promotional campaign in Turkey is a great opportunity to promote the most important achievements that have been made up to date and to showcase the services we deliver through the direct meetings with the shipping companies and ship-owners, all over the world". ODD will participate by displaying a presentation on the most important facilities it has and the competitive advantages. "The Omani-Turkish relations are witnessing steady growth in a variety of economic fields. This visit to Istanbul comes in line with supporting and deepening these relations. Turkey is one of the most important emerging economies. By joining the European Union, turkey gave a big push forward to its economy, turning it to an attractive economy. During this visit we will have the opportunity to be informed on the Turkish experience in port sector, as well as, showcasing SEZAD and the investment opportunities, either in logistics or industrial", Eng. Hashem Bin Taher Al Ibrahim, Business Development Senior Manager at Duqm Port Co., explained. It should be mentioned that the economic and political stability in the Sultanate, as well as, the strategic geographical location are vital incentives for investment in SEZAD and the other Omani ports. Moreover, the proximity of Duqm Port to the big local markets in Africa and Asia and the possibility of connecting these markets to the counterpart markets in Europe through Duqm Port will play a vital role in attracting more investments. The promotional campaign aims to showcase the investment opportunities, incentives and tax breaks available in a variety of fields such as logistics, tourism projects, fisheries projects, petrochemicals and the already existing projects such as the dry dock, the port and the refinery. The programme of the campaign includes a visit to the Turkish Free Economic Zones.